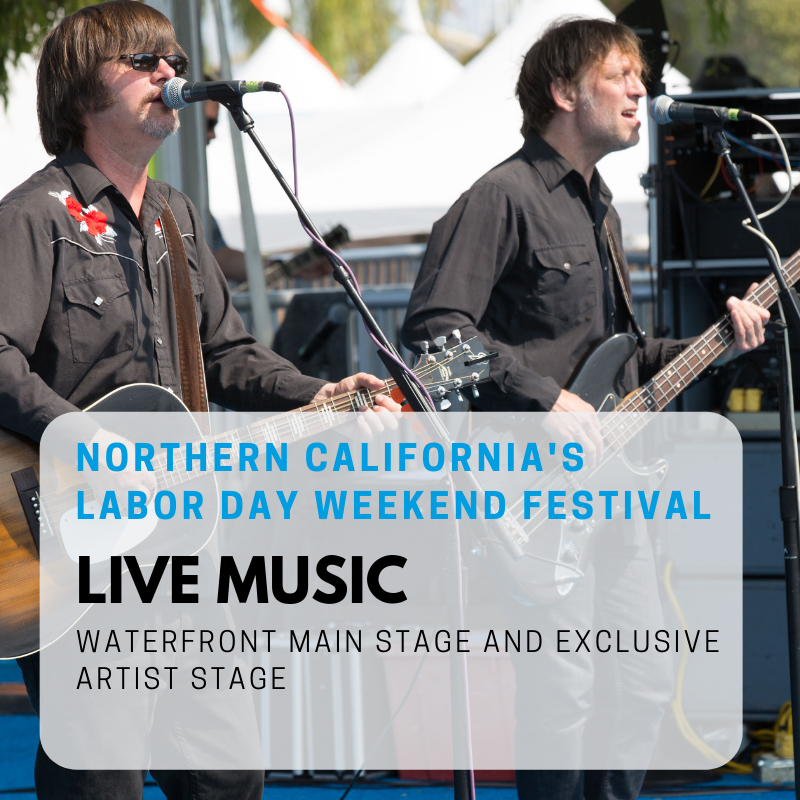 The Sausalito Art Festival, America's premiere waterfront art, music and wine festival, is held annually on Labor Day Weekend. Considered one the most prestigious art festivals in the country, the Sausalito Art Festival brings world-class art, music and wine together on the Sausalito waterfront for a festival like none other. SAVE THE DATE: The 67th Annual Sausalito Art Festival will be held August 31-September 2, 2019. Sign up for information as artist and musician details become available. For information regarding sponsorships opportunities to activate your brand at the 2019 Festival, click here. For information about volunteering at the 2019 Festival, click here. For information about becoming an exhibiting artist at the 2019 Festival, click here. The following information pertains to the 2018 festival and is subject to change for 2019. Saturday, August 31, 2019 - 10 a.m. to 7 p.m.
Sunday, September 1, 2019 - 10 a.m. to 7 p.m.
Monday, September 2, 2019 - 10 a.m. to 5 p.m.
All tickets are valid for one single day of admission. Tickets are also sold on site at the Festival. For the safety and enjoyment of all festival attendees, please observe the following rules. · Each ticket is valid for admittance to one day of the festival. Separate tickets must be purchased to attend multiple days. · Alcoholic beverages are sold within the festival grounds. A valid Driver's License is required to purchase beverages. Beverages include champagne, wine, margaritas, as well as cocktails at the lounges. Regulations require that alcoholic beverages purchased at the event remain onsite. Art Festival security will request disposal of beverages prior to exiting the grounds. For your safety and protection, the Festival provides onsite security. If you need any assistance, or want to report an incident or accident, please locate on of our red-shirted volunteer security or visit the security booth. Please Note: All bags and packages are subject to search. The Sausalito Art Festival reserves the right to decline admittance to anyone who violates the policies established for public safety. Backpacks and large purses or bags will not be permitted. We do not offer bag storage. Mobile Maker Club was created to serve schools, home school groups and individuals that don't have access to tools, a space and professional making expertise. At a school setting the goal is to work with teachers or after school programs to integrate lessons with making and use design thinking when appropriate. For individual students the goal is to acquire skills, develop confidence and create a growth mindset through problem solving, iterating and collaboration. There are many transportation options for traveling to the Sausalito Art Festival. Golden Gate Transit will add extra ferries for the Festival and will sail to downtown Sausalito. Free shuttle buses will transport ferry passengers to and from the Festival. Golden Gate Transit’s bus service is also available; contact 415.455.2000 or www.goldengate.org for ferry and bus information. For those traveling to the Festival by car, take Highway 101 North or South to the Sausalito/Marin City exit and follow the signs to the Sausalito Art Festival. Fourteen acres of paid parking lots, including Handicapped Areas are available for Festival patrons. Parking is coordinated by the Sausalito Rotary Club, and is operational from 8:30 a.m. to 7:00 p.m. Parking Lot directional signs are posted at the Marin City / Sausalito exit and along Bridgeway. The downtown Sausalito Ferry Landing Parking Lot is serviced by a Free Festival Shuttle Service to and from the Festival’s front gate. Chair seats may be no taller than 8” from the ground. Chair backs may be no taller than the shoulder height of the occupant (no exceptions). Please use only the space you need. Areas between reserved tables are off limits for blankets.